I’ve been using Palmer’s Cocoa Butter since my early teen years. I apply it all over my body at least once per day, it’s my favourite moisturizer. Palmers’ has been releasing a lot of new products lately and every one that I’ve tried I’ve liked. Palmers recently came out with a cleansing oil for the face. I’ve never used a cleansing oil before this because they just seem like more work than a regular cleanser. I decided to give the Palmer’s Cocoa Butter Formula Skin Therapy Cleansing Oil a go and was pleasantly surprised. Typically I remove my eye makeup with eye makeup remover and then I use a facial cleansing wipe to remove my foundation. Then after that I use whatever cleanser I’m using at the moment to remove the rest and cleanse my face. I decided to skip all my cleansing steps and use the Palmer’s Cocoa Butter Formula Skin Therapy Cleansing Oil alone to see how it performed. I couldn’t believe how easily the cleanser removed my eye makeup remover. I’ve never found a remover that will remove all my eye makeup completely. I’ve tried drugstore ones, high-end ones and no matter what I do I’m always left with some black under my eyes. 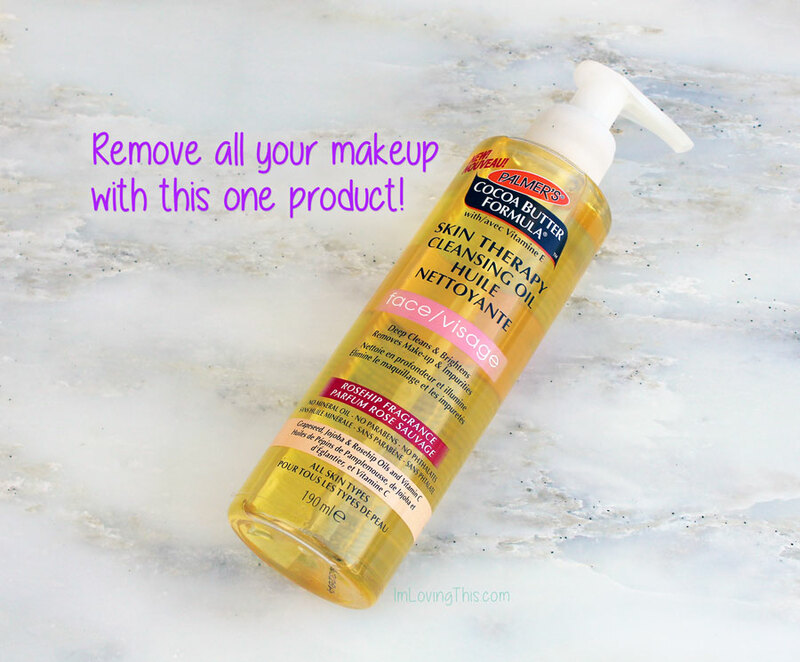 The Palmer’s Cocoa Butter Formula Skin Therapy Cleansing Oil took off all my eye makeup. I was amazed! I didn’t have to stand there and rub my eyes for five minutes and use up a pile of cotton pads. Plus, the next morning when I took a shower I didn’t wake up with black under my eyes. YAY! The cleansing oil rinses off my face after only about 3-4 splashes of water. My skin feels silky and smooth every time I use it. There isn’t any residue left behind after using it. After I used the cleansing oil for the very first time I did a test and took a facial cleansing wipe and wiped my face down to see if there was any foundation left. To my surprise there was none, the Palmer’s Cocoa Butter Formula Skin Therapy Cleansing Oil removed all my makeup in one go. The only thing that I didn’t like about the Palmer’s Cocoa Butter Formula Skin Therapy Cleansing Oil for the Face is that it has an strong Rose Hip Oil scent. I’m used to it now, but when I first started using it the scent was overbearing. You can even taste it if you get some on your lips, which is bound to happen. I have combination skin, I’m more oily in the t-zone. Plus my skin tends to be more oily in the summer and is typically more dry in the winter. It’s summer right now and I’ve been using the cleansing oil for over a month and haven’t had any abnormal breakouts. I had a hormonal breakout, but that is normal for me and has nothing to do with my skincare routine. So no, I haven’t had any breakouts caused by the cleansing oil. It claims that it is for all skin-types and that it won’t clog pores. Apply Palmer’s Cocoa Butter Formula Skin Therapy Cleansing Oil to your dry face with damp hands. Massage it gently into the skin and emulsify with water. Close your eyes to remove your eye makeup and then rinse with water. What Oils are in the Cleansing Oil? The Palmer’s Cocoa Butter Formula Skin Therapy Cleansing Oil retails for $9.00 for 190 ml. You can find Palmer’s products Wal-Mart (that is where I always purchase mine) and similar stores. I really like the Palmer’s Cocoa Butter Formula Skin Therapy Cleansing Oil and will probably purchase it again for my night time cleanser. It works well, it’s inexpensive and the bottle lasts a long time. Also, I will save a lot of money on expensive eye makeup removers and facial cleansing wipes by just using this one product to remove my makeup. I have been using the Palmer’s Cocoa Butter Formula Skin Therapy Cleansing Oil along with the Palmer’s Skin Therapy Oil for the Face so stay tuned for a possible review on that in the future. I haven’t been using the oil long enough to give an honest review. I like to use skin care for a long period of time before doing a review. Do you use cleansing oils? What one is your favourite?